Dingbats aren’t just dizzy dames like Edith Bunker–they are decorative symbols or glyphs in stylized fonts used by printers and designers to beautify pages and add interest. In a dingbat, or “ornamental” font, each letter and character on a keyboard can be used to represent a design, so that that image appears every time you type the corresponding letter. There are thousands of dingbat fonts available for download on the Internet. Some are already included with the set of fonts that come installed in computers. Many of the designer fonts available are “shareware” or “freeware” , meaning that anyone can use the images freely by permission of the designer at little or no cost. Other fonts must be purchased in order to use them for commercial purposes; many fonts will come in a .zip file that contains the font (.ttf) file itself plus information about the artist and the conditions of use. Its important to respect the copyrights of all artists and authors, and to give credit where credit is due. One of my favorite fonts is an interlocking set called Kitchen Tile that was designed by Gabrielle Gaither, who’s condition for commercial use was $5 and name credit. (It only costs $2.00 for non-commercial use!) As a courtesy, I sent her a copy of the book in which the information about her font appeared. Other favorites include almost all of the fonts available through House of Lime. The designs there are not freeware, but can be used for personal use–just read the terms there. 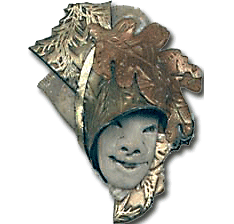 Many of the designs must be resized using Adobe Photoshop or another image editing program to make them suitable for using as transfers, etc. Line Dings and Knot Maker, designed by Brian Kent of Aenigma Fonts are some of my other new favorites. These are both examples of fonts that interlock. 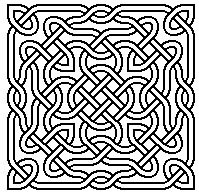 Knot Maker can be used to create intricate Celtic knots, as shown in the image above. 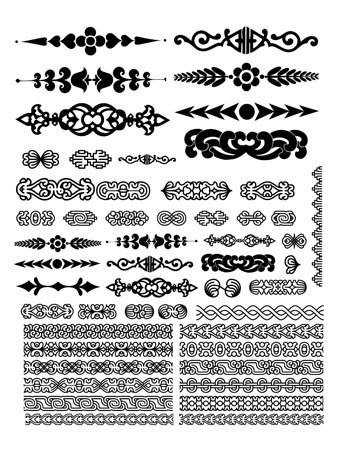 (Its “code” is revealed later in this page) All the dingbat fonts are useful both in creating interesting pages destined for print media, for decorative elements on web pages…and for the creation of tools for paper or polymer clay like transfer art or rubber stamps. Here are a few of my favorite places to gather dingbat and other kinds of fonts. This is an example of two glyphs from the interlocking dingbat font Kitchen Tile at the 72 pt. size. It includes “aAaAaA” on one line, and a second line is fitted into place underneath with “AaAaAa”. Gabrielle’s font Quilters Delight also interconnects this way. There are several of ways to install Fonts. When they come in a .Zip file, you need a program like WinZip to un-compress the folder. This is available for download at: http://www.winzip.com (Many thanks to Brian Kent for permission to use his instructions here) The quick and easy way to install the font is to just Unzip and place the font file [.ttf] into your Windows\Fonts directory. 1] Unzip the Font(s) to a folder (or somewhere, just remember where you unzipped it) on your Computer. 2] Next, click on the START button, then select SETTINGS then CONTROL PANEL. 3] When the Control Panel Window pops up, Double Click on FONTS. 4] When the FONTS window pops up, select File then Install New Font. 5] An Add Fonts window will pop up, just go to the folder that you unzipped the Font(s) to, select the Font(s) and then click on OK. Now the Font(s) are installed. In addition to the normal upper and lower case letters, symbols, and numerals seen in most fonts, some also have additional symbols and characters that you might want to use but that don’t have a dedicated key on your keyboard. To view all of these, you can use the Character Map application that comes with Windows. If you have Character Map installed in Windows it usually be found under: Start Menu/Programs/Accessories/System Tools This application is simple to use. The font name is listed at the top with a drop down menu of the all fonts you have installed on your system. The individual characters are shown very small, but when selected with a click, you see a larger version. Highlight the character that you want and the program tells you the keystroke in the lower left status bar. You can copy and paste it, or use the Type command in Photoshop to select the characters you want to use. The Character Map application can be dragged and dropped onto your desktop for frequent use. You can download programs like Font Manager. You can also make yourself a “cheat-sheet” which is very helpful for those who like a larger and more permanent visual record. To make mine, I used Microsoft Word from the Office Suite of programs. If you have Word, you can download and use the file I created called FONTTABLE.doc to make and print your own reference pages. Save the file to your computer, then open it in Word. The file consists of a table 12 columns wide and 16 rows long. The columns are divided into sets of pairs, with the characters each shown in Arial 12 point type in the left and the same character in 36 pt. type on the right. This gives you one small and one big version of each. Click at the top of the column starting with a large lower case “A” and select the entire column. Then use the drop down font menu and choose your desired dingbat font–with that one click that selects, the entire column will change to that font, while keeping the smaller version to the left in Arial for comparison. You can then do this for every large sized column. The quick and easy way is to use the Format Painter—while your newly changed column is still highlighted, click the cursor on the paintbrush icon on the tool bar and then immediately click to choose the next column of large sized type—-viola; it changes to the new dingbat font. ONLY change the large sized columns, and you will have your cheat sheet. Print it out and collect them all a notebook for ease in visual use. I notate the name of the font and the size of the displayed font on the printout, as some require being done at a larger size like 72 pts. to really be able to see them well. If you don’t have MS Word you can probably do this same thing with another word processing program. My favorite way to use dingbats is with Adobe Photoshop, where I get the absolutely best quality image, and can work with it the most. When creating designs to use for making ReadyStamp rubber stamp and matrix tray sets, I want a 300 pixels per inch for the best resolution. Open Photoshop, choose FILE, NEW, and from the dropdown menu PRESET choose LETTER. This should give you a 8 1/2 by 11 inch letter sized file in which you have a white background and 300 pixels per inch. If you work with a smaller resolution, your print outs may be distressingly tiny. Choose Bitmap or Grayscale for your Color Mode, and the file will be between 1 and 8 M; if you leave it at RGB it will be many times larger for no good reason— rubber stamps are created using black and white art. If you want to use color for web or print images, you can reduce the size of your working canvas to create smaller files. Here’s the lower case “b” and “o” characters from the Kitchen Tile font. I used the type tool to create the line “bobobob” and then used a second Layer to type in “obobobo” in order to stagger the design. Layers were carefully moved to create a seamless join. You can use the Duplicate Layer command to make more rows and place them together to form a larger pattern. The resulting black and white design is ready to be used in making a clay transfer, PHOT-EZ silkscreen stencils, or rubber stamps that can be purchased from a wonderful Cerebral Palsy Association sheltered workshop company called Ready Stamp. I’ve had quite a few sets of stamps made there, and they have been some of my favorite tools for art making for decades now. Here is a set of images I recently had made into stamps. T hese are using characters from fonts called “Linedings” and “Deco Borders”. I’ll use them with polymer clay to create miniature furnishings for dolls, beads and designer jewelry, tiles for mosaics and many other applications. When having your own stamp sets made, you can fit in as many images as possible into a 7″ by 9″ rectangle, and have them reproduced in uncut rubber stamps and matrix tray form for only $32 plus S/H! For more information about Ready Stamp read the web page I built specially for these fabulous tools…they are my ABSOLUTE FAVORITES, and I support the company wholeheartedly and urge you to give them a try. When using dingbat fonts, remember that you can put different bits and pieces together from more than one font, and you can create collaged images all your own. Try changing the size of the font, or its orientation—-when displayed vertical orientation rather than horizontal the differences can be very useful! 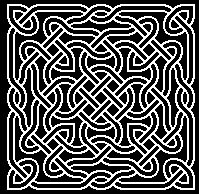 you would get this knot image shown at the top of the page. Putting each line of type on a separate Layer allows you to manipulate how closely they are joined and create a seamless image. Another great tip is to select the image, choose IMAGE, then ADJUSTMENTS, the choose INVERT. This gives you the negative of the image, as is seen here. Do be aware that collecting fonts, and particularly dingbat fonts, can be VERY addictive. I have over 900 fonts, with 100 dingbat fonts, and I am only beginning. Many people have far more, and having them all active on your computer can seriously slow down performance. You can keep many of them inactive until you need to use them, especially once they begin to really add up.